This makes a great addition to some of our butterfly garden kits.Kids and adults love the sucker inside that seems to melt in your mouth. 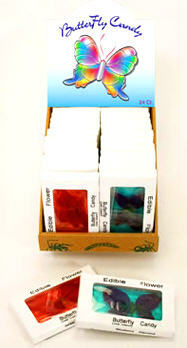 The butterfly candy is one of our top selling edible treats. Be sure to choose Blueberry or Strawberry flavor. Butterfly Candy - Contains real edible flowers on the wings that are infused into the candy. It does not contain a real butterfly though. Kind of unique and is a great conversation starter. Now in the middle which forms the body you do get a real bug pupae of a mealworm. On Sale now Buy your Butterfly Bug candy today, go into the office break room and pull it out. It will surly amaze or disgust your co-workers when they see this delight from our insect kit website.